•To align staff and senior corps on shared mission, vision, strategy, goals and culture. •To build skills and knowledge to support individuals work, and City Year’s collective efforts to help achieve transformational outcomes for students while developing corps members as leaders. •To connect staff and senior corps members as a united workforce of practising idealists, and begin to build bonds and networks among City Year’s communities of practise that will serve as an ongoing learning resource throughout the year. Approximately 1000 staff were in attendance and 300 workshops were held over 6 days from 16-21 July. It took Errol and I roughly two days to travel from Johannesburg to Boston, and we were tired when we arrived, but the spirit, inspiration and energy we felt from our colleagues in the US, really made the jet lag seem minor in comparison. The week was intense, filled with workshops, reflection and sharing, and the Summer Academy team did not disappoint. They infused spirit and fun into everything that we did. In between all the hard work, we had an amazing talent show, where staff and corps members from around the network displayed a multitude of abilities and gifts, and we were warmed up everyday with some great Physical Training. 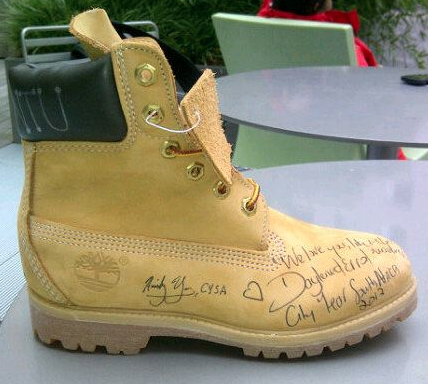 One of my favourite moments from the week was receiving the Ubuntu(My Humanity is Tied to Yours) Boot. This acknowledgement arose from a week long campaign to acknowledge staff and senior corps who displayed City Year Values. Errol and I were also lucky enough to get some one-on-one time with City Year CEO and Co-Founder Michael Brown. We talked about how important it is to grow City Year globally, and Michael re-affirmed that as staff we all have a big responsibility to grow and improve City Year, so that it can effect even greater change in the lives of others. Having learned so much and acquired so many new tools, we are bursting with excitement at the prospect of using them to grow City Year South Africa in 2013! 1,003 staff and Senior Corps Members from across the City Year network. 7 days in this year’s Academy. 300+ training sessions were attended by staff and senior corps. 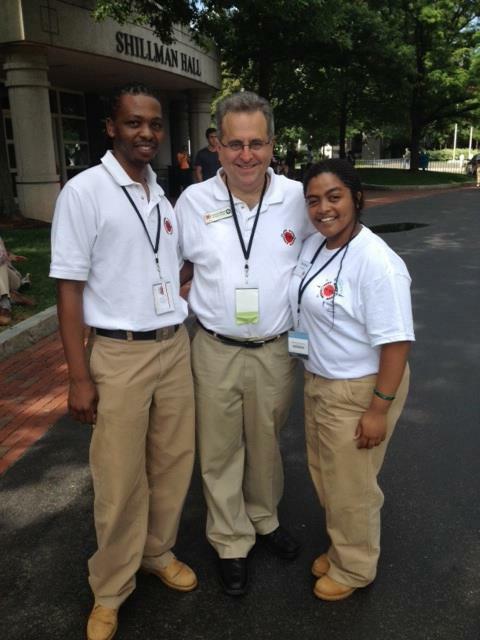 3 new City Year sites attending Academy for the first time! 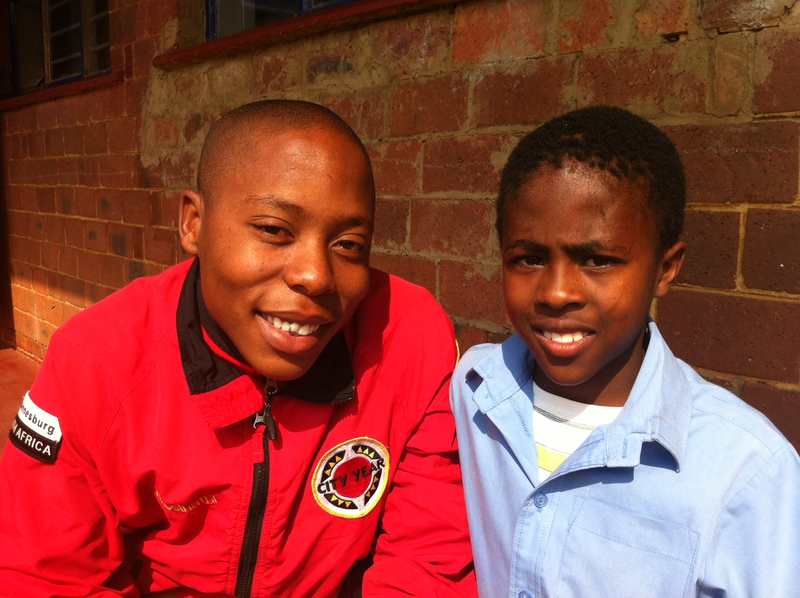 “My name is Rejoice “City Year” Baloyi, the daughter of Putting Idealism to Work. I am 21 years old with a positive attitude and I am full of determination. I demonstrate Spirit, Discipline, Purpose and Pride.” This is how I prefer to introduce myself while I am serving at City Year. I committed this year to service because I believe that I am a change-maker. I have a story about a young, humble and respectful girl called Xolisile, who is a learner at Lawley Primary School, where I am currently serving. Xolisile’s class has one of the lowest pass rates in mathematics and English, so at the beginning of the year, I made it my mission and goal to help them improve as much as possible. I noticed from the beginning that Xolisile had loads of potential, but needed a little bit of help. After attending the City Year Children’s club (After-school Programme), learners including Xolisile showed a significant improvement in their marks, with over 70% of them passing the tests that were prepared for them by their teachers. One particular day I was excited, and looking forward to seeing the learners. I rushed to class, did some icebreakers and then began with the lesson that I had prepared. While I was busy interacting with the kids, I realized that Xolisile wasn’t in class. I asked her peers where she was, and they informed me that she was in hospital. Hearing that was a huge shock. I spoke to Xolisile’s class teacher, who told me that Xolisile was having heart problems. The first thing that crossed my mind after the teacher briefed me on Xolisile’s condition was whether she was going to make it. It felt like I was having a bad dream and that at any moment someone was going to wake me up. A week passed and I learned that the operation to repair Xolisile’s heart went well. I was so relieved to hear that! Three weeks after the operation, she was back in class and I was extremely excited to see her. Seeing her smile again was overwhelming. Unfortunately now she was struggling a lot more than she was before she had the operation. Her concentration level was very poor, and I noticed that she wanted to give up, but I couldn’t let that happen! I paid extra attention to her, and constantly motivated her, simply because I sincerely believe that she has unlimited potential within herself. Hard working Xolisile is now on par with her peers in mathematics and English, and I am happy to say that I have made a difference, not only to her, but also to most of the learners in my class. Thanks to City Year for giving me the chance to spread my wings. I am now one of the young change-makers in South Africa and the world!